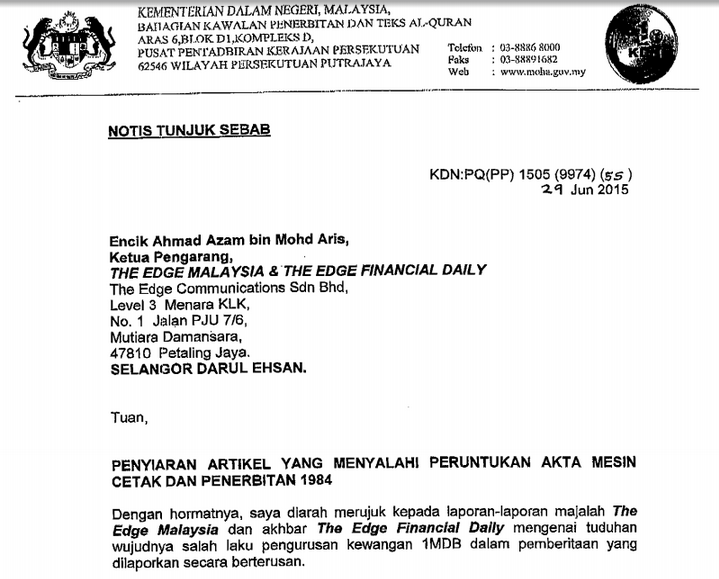 I would like to confirm online news reports that we have received a show-cause letter from the Home Ministry giving us seven days to provide a written explanation on why action should not be taken against The Edge Malaysia and The Edge Financial Daily under the Printing Presses and Publication Act 1984. We are accused of publishing articles on 1Malaysia Development Bhd (1MDB) that have created confusion and doubts about the government and our financial institutions. We are also accused of relying on an Internet portal for our articles. The letter did not specify the articles. We have been reporting about 1MDB since it was known as Terengganu Investment Authority (TIA) and in the last six months we have published more‎ than 300 articles on 1MDB from various sources – Bernama, Bloomberg, Reuters, The Business Times Singapore, Euromoney – and our own reporting from the media channels in The Edge Media Group .We will be compiling them to help any investigation into our alleged offences. We base our articles on carefully evaluated evidence. We have asked the ministry for an extension of the seven days for us to reply in detail. The ministry must clarify which of our articles are wrong and create confusion and doubts about the government. The Edge believes our articles to be truthful. To date, not a single party that we have mentioned in the articles has taken legal action against us. As we have stated previously, we stand by the articles we have published and we intend to show it. – July 1, 2015. ← Sarawak Report, did you just fall into a Trap?